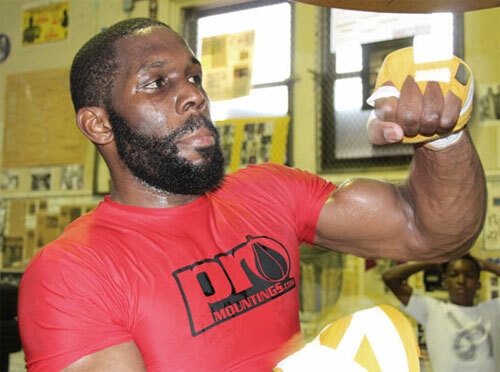 Heavyweight contender Bryant Jennings, 16-0, 8 KOs, held an open media workout Wednesday at the ABC Rec Center Boxing Gym in North Philly as he prepared for his upcoming 10-rounder against Andrey Fedosov, 24-2, 19 KOs. Jennings and Fedosov are scheduled to meet at the Sand Casino Resort, in Bethlehem, PA, on June 14th. Jennings hit the heavy bag and speed bag, sparred 10 rounds, and did push-ups and sit-ups. But he had already been working earlier in the day. "You should have been with me at 4:30 this morning," Jennings said of his morning roadwork. "We did five miles. My fastest mile was 6 minutes and 4 seconds, by the way." This will be Jennings' first fight in six months, a stark difference than 2012, when he fought five times during the year. Jennings said that it was the business of boxing that caused his layoff. "Welcome to the fight game," Jennings said repeatedly. "There are a lot of things that come with it. Some things you have to get situated. Some things that take place, some things that we can't help. Obstacles coming our way. Just iron them out, and just get to it. But at the same time, you have to maintain your focus, maintain your shape, your mentality, and everything , and still be there. I'm pretty anxious (to get in there and fight again). I'm a busy kind of guy. So I have to stay busy. " Jennings also said that he was ready to fight for the world title, as soon as any of the champions, specifically Klitschko brothers, were willing to face him. "I'm on my path," Jennings said. "I got the heart. I got the will, and I have the skill. I just think that I wouldn't have done worse than any of the guys that went in there (against the Klitschkos). We don't know what's in their minds. We don't know if they fear me, or if they are just overlooking me. We just know it's very hard to get a fight with them." In the meantime, Jennings and Fedosov face off as part of a nationally televised triple header on NBC Sports Network, Friday, June 14th.